• The Indian apparel sector could continue facing tough times in the coming months, after four successive years of weak performance. • During April-February, 2018-19 apparel exports have witnessed a decline by 5.3% yoy, led by a sharp drop in exports to UAE. • Indian exporters face increasing competition from Bangladesh and Vietnam, which benefit from lower labour costs. Besides this, the case against India’s export subsidies at the WTO is expected to impact the textile sector. • It is urgent for India to expeditiously conclude trade agreements with major importing nations, apart from enabling exporters to upgrade on technology and move up the value chain. Apparel exporters are headed for difficult times ahead, due to a decline in demand from major markets. Although exports were showing promise in the beginning of the year, there is now a decline in both volume and value terms, according to a report by Drip Capital, which analyses macro trends and proprietary data of the top 100 apparel exporters which posted business of US$ 32 billion for the year till date. During April-February 2018-19, exports of readymade garments from Indian were valued at US$ 14.42 billion, a decline of 5.3% yoy. Fall in demand from the UAE has proved to be a major setback, since it is a major market for Indian apparel. A number of manufacturing units have now been set up in free market zones in UAE, leading to increase in raw material imports over finished goods. During April-January 2018-19, exports of apparel and clothing to UAE (chapters 61 and 62) reached US$ 1.6 billion, a sharp drop considering the corresponding figure of US$ 2.82 billion for FY 2017-18. This drop has countered the impact of the increase in exports to the US and EU. 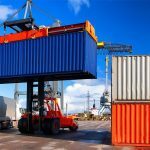 Exporters are also focusing more on markets witnessing strong growth like the US, UK, Chile, Israel and Japan to counter the decline in markets like France, Sri Lanka, Middle East and Sudan. Last year, an ICRA report affirmed that 2018-19 will continue to be the fourth consecutive year of weak growth for the Indian apparel sector, with a de-growth of 4-5%, following a similar de-growth of 4% in 2017-18; and low growth rates of 1% and 3% in FY 2015-16 and FY 2016-17 respectively. This is despite a revival in the global apparel trade, which grew by 4-5% yoy during the first half of calendar year 2018. 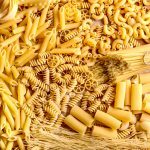 A major cause of this has been the growth in imports by EU, which accounts for two-fifth of international apparel trade. The turbulence was also linked to the transition to GST, changing positions on export subsidies and rupee appreciation, which affected the industry’s standing in a highly competitive global market. While the GST issue is getting sorted out, a new challenge confronts Indian exports, which has major ramifications for the textile sector. The US filed a case against India at the WTO, alleging that India’s subsidies were harming US companies. Its complaint earmarked five schemes, including Merchandise Exports from India Scheme (MEIS) and Export Promotion Capital Goods Scheme (EPCG). The US argues that since India has recorded per capita gross national income (GNI) > US$ 1,000 for three consecutive years, it is no longer eligible to provide these subsidies. The US, which is India’s top export market, recorded imports of US$ 3.3 billion during April-January, 2018-19. In comparison, its imports from India stood at US$ 3.86 billion in 2017-18. 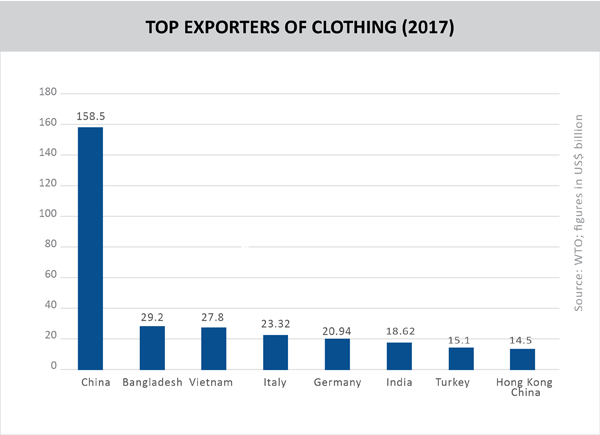 Bangladesh and Vietnam are emerging as important nations for apparel exports due to their low labour costs, and are aggressively capturing the emerging opportunities due to China’s declining share in the international market. Even India’s imports are increasing from Bangladesh and Vietnam, due to which the government increased import duties on over 330 textile items last year. Bangladesh fully exempts customs duty, due to which Chinese fabric is coming duty free to India via Bangladesh in the form of garments. 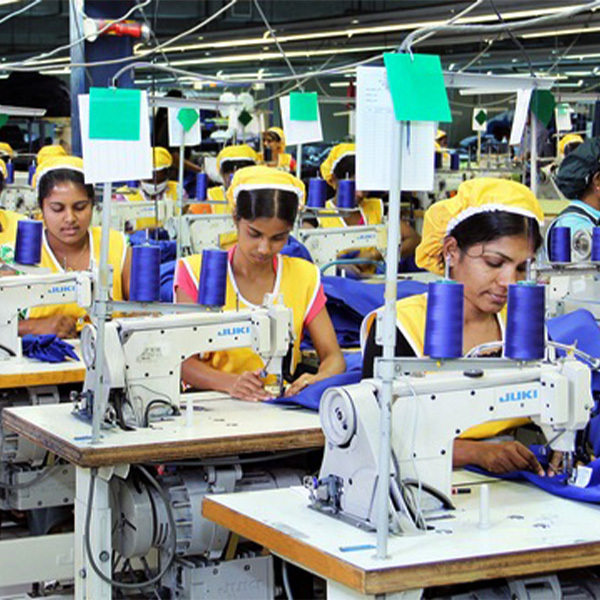 Apparel imports from Bangladesh have risen from US$ 140 million in 2016-17 to US$ 201 million in 2017-18. 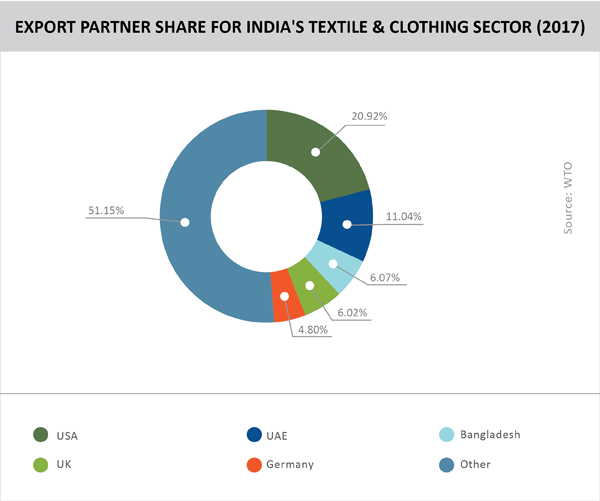 One major area that is impacting India’s apparel exports is the lack of trade agreements. Due to the slow progress of the Doha round, a number of trade agreements have been signed leading to zero or preferential tariff arrangements between member countries. India does not have any FTAs with major apparel import destinations like EU, US and UAE, which severely impacts its competitiveness. For instance, in a category like T-shirts and singlets, which accounts for 16% of India’s apparel exports, the US imposes a tariff rate of 32%. For silk shawls and scarves, the US imposes 11.3% on India, while the Republic of Korea faces zero tariffs due to an FTA. This could get worse, as the US is now resorting to a wide range of protectionist measures. India has a Comprehensive Economic Partnership Agreement with Japan, but the latter is not a major export destination for apparels. Moreover, it is alarming that despite the agreement in August 2011, India’s share in Japanese apparel exports increased initially, but later declined and are now stagnant. Meanwhile, India’s market share of Japanese apparel imports continues to languish at 0.09%, compared to China (6.46%), Vietnam (1.17%) and Bangladesh (0.34%). 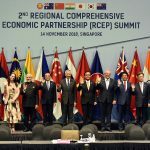 India is currently negotiating the Regional Comprehensive Economic Partnership (RCEP) with ASEAN members, Australia, China, India, Japan, Republic of Korea, and New Zealand, which could lead to zero tariffs between member countries. However, this may also lead to a sharp rise in imports from nations like China, Vietnam and Republic of Korea, which currently face a Most Favoured Nation (MFN) tariff of 25% in India. Vietnam is gaining ground in the US, and is expected to do even better if the Comprehensive and Progressive Agreement for Trans-Pacific Partnership (CP-TPP) and the EU-Vietnam Free Trade Agreement are successfully concluded. Bangladesh has similarly leveraged GSP to increase its market share in EU from 7% in 2001 to 20% presently, even as India stays at 6-7%. These developments are indeed worrying, considering that the EU accounted for 37% of India’s apparel exports in CY 2018. Around 90% of India’s garment manufacturing units are in the unorganized sector, and 78% employ less than 50 workers. This implies that most of them are too small to implement significant technology upgradation and have to continue to compete at the bottom of the value chain. This is further exacerbated by high logistics costs of around US$ 7/km in India compared to US$ 2.5/km in China and US$ 3/km in Sri Lanka. The Drip Capital report also makes the case for incentivizing textile exporters to upgrade to better technology by expansion of the Credit Link Capital Subsidy Scheme for Technology Upgradation and the Technology Upgradation Fund Scheme. The WTO permits such schemes for technology upgradation, and leveraging them becomes extremely important due to India’s declining labour competitiveness. 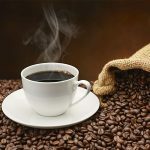 Aggregating the smaller players into clusters is also critical, so that they may develop the muscle to get back into the reckoning in the international market.